Grand Central Publishing, 9781478970507, 224pp. 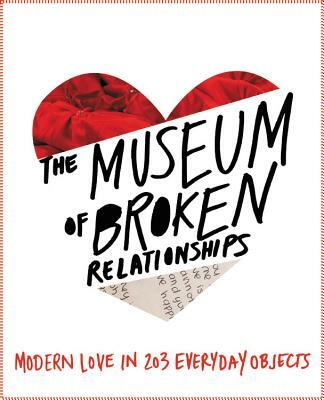 In the spirit of Humans of New York and PostSecret, MUSEUM OF BROKEN RELATIONSHIPS is a gorgeous gift book celebrating the objects that outlast love: a poignant, funny, sometimes bizarre and always delightful window into modern love and loss. A postcard from a childhood sweetheart. A wedding dress sealed in a jar. A roll of undeveloped film. An axe used to chop an ex-lover's furniture in a fit of rage. A wind-up toy, a bar of bath soap, a tin of Love Potion with the simple caption "Doesn't work." These objects, and many more, make up the whimsical, imaginative, poignant population of the Museum of Broken Relationships. Started by two former lovers who wanted a way to commemorate their relationship even after it ended, who couldn't bear to simply throw away the objects that had once meant so much, the Museum of Broken Relationships has captured hearts and imaginations around the globe since its founding in 2010. Anonymous submissions have poured in by the thousands: objects with brief, compelling captions confessing to the story behind their meaning. The museum's Croatian exhibit quickly became a main draw for tourists from around the globe, and has garnered enthusiastic, glowing media attention from sources as disparate as the New York Times and the Chinese national news. Now, as the physical museum arrives for a permanent spot in Los Angeles, the authors have collected the best, funniest, most heartwarming and heartrending stories from their huge selection of submissions. Much like the bestselling Postsecret series, this beautiful oversized, four-color book will offer an irresistible glimpse inside other people's secret worlds, creating moments of deep human connection. It is a must read for anyone who has ever loved and lost. Olinka Vistica is an arts producer, born in Split, Croatia, and cofounder of the Museum of Broken Relationships. She holds master's degrees in English and French language and literature from the Faculty of Humanities at Zagreb University. Drazen Grubisic is a versatile visual artist from Zagreb, Croatia. He holds a master's in painting from the Academy of Fine Arts in Zagreb and is a cofounder of the Museum of Broken Relationships.